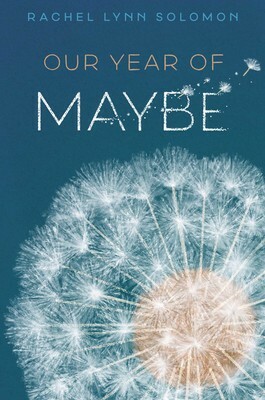 Our Year of Maybe is out today, and I’m so excited to celebrate with an interview from author Rachel Lynn Solomon! Our Year of Maybe focuses on the aftermath of a kidney transplant between two best friends. What kind of research was involved for writing this complicated subject? I spoke with doctors, donors, and recipients to get a full picture of what each person goes through during a transplant. I also watched videos, read articles and firsthand accounts from donors and recipients, and took copious notes. While of course writers excel at bending the truth, and there’s a very small chance that someone’s best friend would happen to be a perfect match, that does still mean it’s possible. And that’s what was important to me—the fact that this could happen. Both You’ll Miss Me When I’m Gone and Our Year of Maybe feature complex characters with messy relationships. How does your writing process work in creating these types of characters and situations? Those are definitely my favorite things to write! In terms of crafting complex characters, I’ll say that I really, really love details. In fact, small details often come to me before bigger character and plot arcs—quirks, habits, ways of speaking, etc. It also doesn’t feel realistic to me to write teens who aren’t flawed or who don’t make mistakes. Those characters, the messy ones, feel most relatable to me. I’m most interest in exploring relationships that haven’t been explored very much in YA, or haven’t been explored in quite the way I’m exploring them. (Pretend I didn’t use the word “explore” four times in that sentence, yikes.) So, while of course best friends—with one in love with the other—have been written about, I hadn’t come across a story like this with the added complication of a kidney transplant. And with You’ll Miss Me When I’m Gone, of course there are sister books out there, but there aren’t many with Jewish sisters, or dual POVs with two female characters. I often hear from authors that writing their second novel is harder. Has this been the case for you? Do you have any writing tips? Yes, definitely. In my case, I was revising OYOM while reviews for YMMWIG were coming in, and for a while, it was tough to focus on OYOM without all those new voices in my head. Ultimately, I had to focus on the story I wanted to tell, which meant thinking about the kind of book my teen self might have needed: one about yearning, a codependent friendship, and the ways we sometimes give so much of ourselves to another person in the hopes that they’ll return our affection. And I’m really pleased with how it turned out. What are some of your favorite YA contemporary novels? I know readers will love to hear some recommendations! I was so excited when I read the announcement about your next book, Today Tonight Tomorrow, as enemies-to-lovers is my favorite trope! Is there anything you can share about it with us? Thank you! It’s my favorite too, and it’s been an absolute blast to write! I’m in the middle of revisions right now. I can say that it takes place over 24 hours on the last day of senior year and the main characters are academic rivals. It’s probably the slowest burn I’ve ever written, which hopefully makes the payoff even sweeter. Like my first two books, the protagonist and love interest are both Jewish, which is a significant part of their identities. The book is also a love letter to Seattle and features some of my favorite places. It’ll be out in the summer of 2020! I don’t think I could ever donate a kidney. –It sounds like this novel is quite fraught, friendship-wise! Many thanks for the great interview!